Students and faculty can sign up to tour historical spots and learn cultural differences in burial practices. Mortuary science students, faculty and staff will take a trip to New Orleans Nov. 8-11, where they will tour funeral homes and a cemetery and visit the French Quarter. The trip is open to all faculty, staff and students on a first-come, first-served basis, and 14 spaces remain. The maximum number of participants is 56, mortuary science Instructor Darrell Woody said in a Sept. 27 interview. Participants will make the roughly eight-hour trip via bus, departing from Nail Technical Center at 11:30 p.m. Nov. 8. The cost is $400 per person. The final exact-cash payment is due Nov. 2. Participants can pay in full or make $200 payments Oct. 5 and Nov. 2 to Woody in Room 233B of Nail. The fee is nonrefundable. Participants will arrive at the Crowne Plaza New Orleans French Quarter hotel at 739 Canal St., at 9 a.m. Nov. 9. First-day activities will include a walking tour of the French Quarter, a tour of the Jacob Schoen & Son funeral home and dinner at the Oceana Grill, with about five hours in between for participants to explore the area. Second-day activities will include a Honey Island Swamp Tour, a tour of Lake Lawn Metairie Funeral Home and a stop at the French Market by 3 p.m. on Nov. 10. Lastly, participants will stop by St. Louis Cemetery No. 2 on Nov. 11 before departing for San Antonio at 11:30 a.m. Arrival at this college is expected at 11 p.m., according to an itinerary provided by Woody. Woody said mortuary science began the New Orleans trips to show students the cultural differences within the funeral industry. One of the differences between local and New Orleans cultures is the way New Orleans cemeteries bury bodies, mortuary science Coordinator Jose Luis Moreno said in an interview Sept. 25. 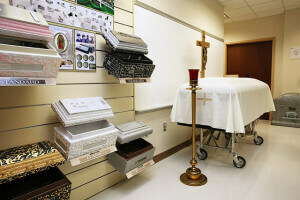 Moreno said the above-ground vault style of cemeteries, which can hold multiple caskets at once, is a French-influenced design.